The Auslan Picture Dictionary e-book is a 107 page PDF and has over 1,000 signs and pictures combined. Each signs are labelled and has a matching picture. There are 25 topics to choose from: Alphabet, Action, Animals, Body, Calendar, Clothes, Colour, Community, Country, Family, Feelings, Food, Greetings, House, Money, Nature, Numbers, Occupation, People, Placing, Questions, Sport, Time, Transport and Weather. With The Auslan Picture Dictionary e-book, you can select a topic, photocopy the signed pages onto an A3 sized paper, display them on the wall and show students how to sign them. Once the students are familiar with the signs, and are signing them correctly, they are then ready to play activity games (see Suggested Activity Ideas in The Auslan Picture Dictionary), and work on activity sheets from both LOTE Auslan Activity Book A and LOTE Auslan Activity Book B which are based on topics from The Auslan Picture Dictionary. Click HERE to see what The Auslan Picture Dictionary e-book looks like (youtube video). 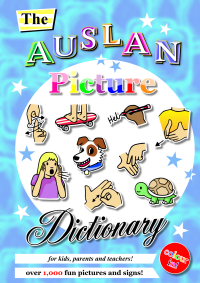 The Auslan Picture Dictionary e-book is copyright and for personal and school classroom use only. The e-book is to be printed only once its entirety per individual/teacher and the individual/teacher may photocopy the e-book as many times for personal and classroom use. Please do not photocopy or reprint the e-book to be distributed to other individuals or teachers, please direct them to this website instead.